The Team Bmx Verona club and the city of Verona are proud to welcome you to the BMX Olympic Arena for the second year in a row, after the 2016 UEC BMX European Championship. The BMX Olympic Arena Verona facility features a SX combo track incorporating both an 8mt SX start hill for Championship classes and 5mt start hill for Challenge classes. The SX track is ab. 450mt long, while the regular track is ab. 380mt. 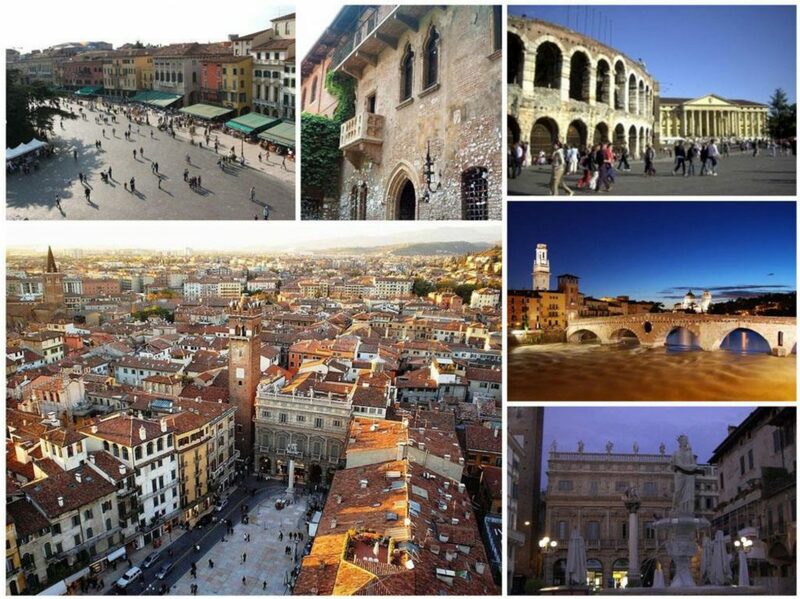 Known as “The city of Romeo and Juliet“, Verona is among the top 10 most visited Italian cities. Located at only 30km from Lake Garda , Mount Baldo range and Lessinia Natural Park, Verona is the perfect location for an active and cultural holiday. Verona is a splendid city of art, surrounded by the traces of its ancient history, splendid in its mythical dimension bestowed upon it by the Shakespearean tragedy of Romeo and Juliet. Roman ruins, medieval vestiges, Venetian and Austrian traces can be seen all across the city, as well as antique palaces, squares, bridges and wonderful churches. A free parking place with amply capacity is situated next to the track for team managers and officials. At a walking distance of about 200 metres there is a second free, amply parking space for riders and visitors. The camping site will be open from Friday 2 June 08.30 a.m.
Price for the whole event (Friday to Sunday) is € 65,00 including water, toilets and showers. No electricity. 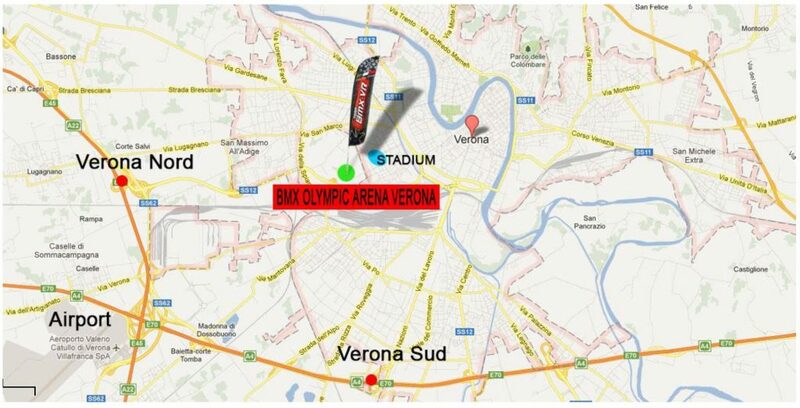 The BMX OLYMPIC ARENA VERONA conveniently lies between the city centre, the Verona Airport and the main highways connecting the city to the others airports of Northern Italy. Driving on motorway A4 (Milan-Venice), take the Brenner motorway (A22) direction “Brennero” then exit at “Verona Nord”. Proceed on SS12 road to Verona center, take exit “Stadio” (football Stadium) and follow directions to “Parcheggio B”. The UEC BMX European Cup 2017 is open to any rider from any country with a national license, in compliance with the UCI regulations. There is no limit on the number of riders from one country that can be registered. The race will be run under the UEC 2017 regulations. Championship riders can score UCI points for their country ranking. Saturday is an HC contest, Sunday will be C1. PLEASE BEWARE: in case of special conditions (weather, wind or else) or a high number of participants, the UEC BMX Commission allows the PCP in agreement with the UEC Technical delegate to reduce the number of moto’s. This can only apply for challenge classes and never for championship classes. Challenge riders are not allowed to have a number on their jersey. Career numbers on shirts are only allowed for Championship riders. Challenge and Championship riders are not allowed to have UCI logo or rainbow stripes on bicycles or clothing, except for Junior and Elite World Champions. Jeans are not allowed in all classes. Only riders aged 13 and older are allowed to use clip pedals. Front and side plates : colors and sizes as per UCI rule book article 6.1.072. Since photo finish system is utilized, each bicycle entered into competition must display a lateral number plate located just behind the steer tube. The number shall be black with a white background. The riders must display the number assigned to him. It is the responsibility of the rider to check he has the correct number on his plate. No correct number or no correct plate means: no authorization to start and then REL. Riders do not receive number plate and side plates !!! All registrations & payments for riders must be made through their own national BMX federation. This ensures that registrations & payments are coordinated. Late registration after National Federation deadline is not possible! Or at the Welcome Centre on registration. We ask the Chefs d’Equipe to bring a bank statement (ask your federation), showing when the payment was made by bank transfer, when they pick up the riders packages in the Welcome Centre. This to avoid any problems. The organization will NOT provide number plates and side plates. Riders have to bring their own and apply them according the rules. The rider must display the number assigned to him by UEC Race Administration. Opening hours Welcome Center: 9.00 a.m. – 19.00 p.m.
Only Championship riders who come in 1st to 3rd place are obliged to attend the award ceremony. The other riders (4th-8th place) can pick up their prize money behind the stage, on presentation of their UCI licence. All the prize money that has not been collected right after the podium ceremony will not be given on a later moment. Cups for places 1 – 8 for both rounds award ceremony. Teams only receive passes during the events when they enter the team competition of the weekend. Teams register final 4 team riders that participate in team competition on Friday during registration (11:00-14:00). – Spaces for team tents, as close as possible to the track, of 6 x 3 m for each team registered for that specific race, at the cost of € 150,00. – The organizer will receive a list of the UEC after registration is closed of the teams who are registered for the race and will need a team space. – Promote the name of the Team during races as listed on the moto sheets. Team BMX Verona will provide spaces for team tents to non-UEC registered teams, of 6 x 3 m for each team, at the cost of € 200,00. • Arriving will be permitted from Friday June 2nd 8.30 AM. • You must leave before Sunday June 4th at 20PM. • Tent area will be closed two hours after the races/practice end. • The organisers will assign space locations. No cars or other motorised vehicles will be admitted to the Team Area. Box office at the Main Entrance. Free entrance: children born in 2008 or later. Riders who enter the tournament do not have to pay an entrance fee. They get an entrance bracelet with their ‘Riders’ envelope’. They will receive this envelope from their Chef d’Equipe. Team BMX Verona offers the option of camping at the event. 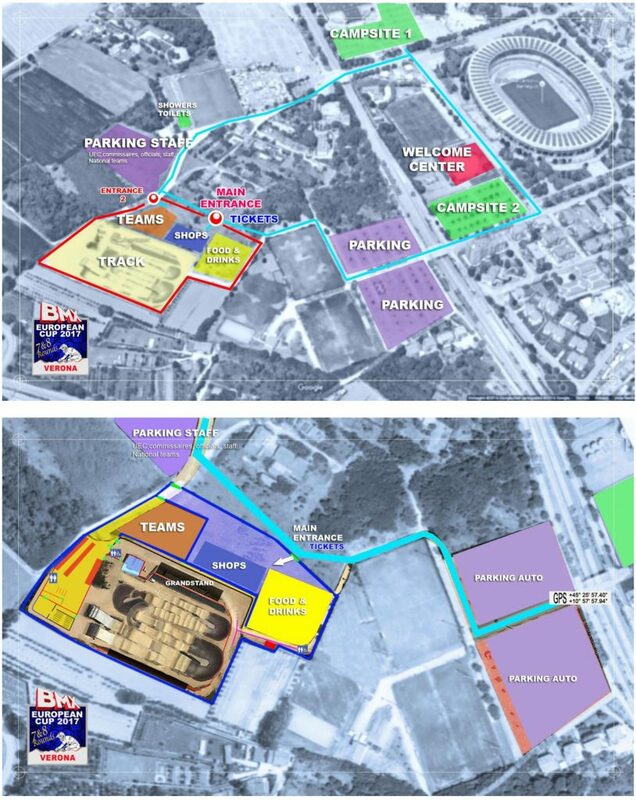 The campsite is situated at the AGSM Forum parking lot in Piazzale Atleti Azzurri D’Italia, 1, 37138 Verona. All of these include showers and toilets, no electricity available. Arrival from Friday 02/06 8.30am. Leave on Sunday 04/06 9.00pm at the latest. – restrooms and fresh water. Upon reception of your payment we will send you a confirmation email. 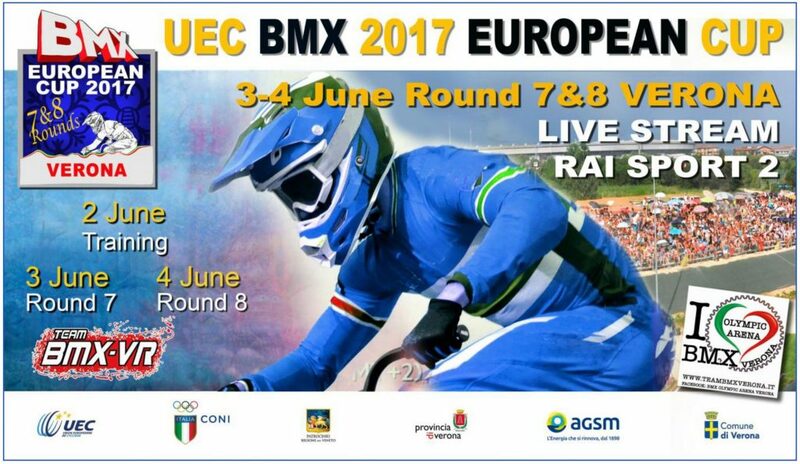 On the 2, 3 and the 4 of June, you can follow the UEC BMX European Cup Rounds 7 & 8 on our website, www.teambmxverona.it, via livestream. Auto parking is situated 200 metres from the BMX-track, just outside of the circuit. This is free. There will be several catering stands, where you can buy hot and cold food and drinks. A BMX Village will be set up during the UEC BMX European Cup. If you would like your shop or entertainment to be present during the European BMX season opener, send an e-mail to shop.teambmxverona@gmail.com to reserve your space in the BMX Village or ask for more information. Mention your shop name, the person responsible, your time of arrival and how much space you need. If you look for HOTEL accommodation: check out our partner hotel DB Airport & Congress Hotel, only 10 min. by car from the track. During the event BIBs will be distributed by the UEC Press Officer. Accredited members of the press also benefit from a special car park close to the track. The number of photographers permitted at the track is limited to 5. Both the UEC/UCI and the organisation will favour said medium. Team Bmx Verona and the city of Verona accept no liability for thefts or damage occurring on the site, during the race, in the car parks or on the track campsite. Please respect the environment and dispose of your waste responsibly.